Next month, I've been in my house a whole year. Whilst I sit here and wonder, where on earth the year has gone, I'm also sitting here with one huge smile spread across my face because for the first time, in history, me and Spud can finally answer the door to trick or treaters! Being huge Disney fans (yep, sorry folks, it's another Disney related post!) we're planning on having a Halloween movie marathon with titles like The Nightmare Before Christmas, Into The Woods and Hocus Pocus, whilst munching on popcorn and treats ourselves, dressing up, and being on guard with the remote control to pause our movie and ready to answer the door every minute - or so we hope! Just like every other occasion we celebrate in our household, Halloween wouldn't be Halloween without Disney involved! Just like Easter isn't Easter without Disney, and Christmas isn't Christmas without Disney! We would love one day to Halloween at Disneyland, but until we can make our dream come true, we'll continue to bring Disney to us! Spud has over 30 Mickey Mouse plushes now, and every year his collection grows! 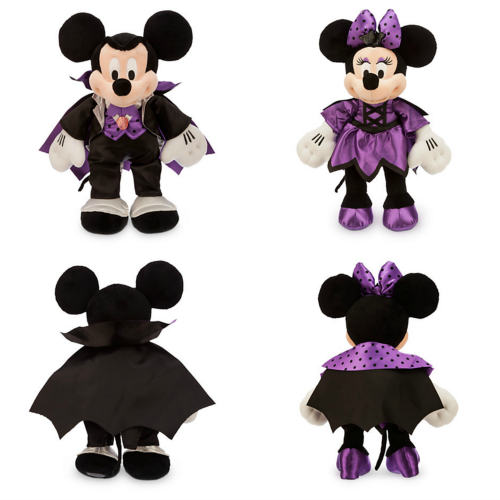 I'm loving these Mickey and Minnie Mouse medium plushes, priced at £14.95 they'll make the perfect gift for children who are staying in this Halloween! Even dressed up as vampires, just how cute do they look!? Opening the door with a bag of sweets just isn't mine and Spud's style! So we're loving the idea of opening our door with this Mickey Mouse pumpkin style trick or treat bowl! Priced at just £10, the bowl can be used by trick or treaters themselves, or by people answering the door and giving out the treats! Then there's the costumes also, I was born in the year of 1990, that makes me 25, but I will forever love Disney, as you can see by the 100s of blog post that are Disney related. Although it's £50, just how beautiful is this Minnie Mouse costume below? It's Minnie's trademark with those spots, and the colours are so Halloween! 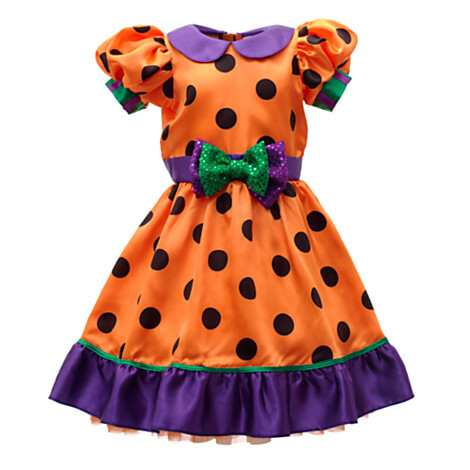 This is just one of the costumes that caught my eye from the Disney kid's Halloween costumes range! I'm just gutted I'm not a little girl no more! I could be here all day telling you about all the marvelous Disney Halloween items I've come across, but I'll leave that for another day! With just 25 days to go until Halloween is here, keep checking back regularly for more Halloween goodies on Unique Young Mum!